This is one of several poems written by Lucy, the heroine of “Stealing Beauty,” as she drifts through an endless house party in Tuscany. I quote Lucy’s poetry because I want to set you a test question. Reading it, how old would you guess Lucy is? Nine? Fourteen? The notion of being “quiet as a cup” is not bad. “Rattle me” is better than “drink from me.” Those double exclamation points, however... Pencils up. Lucy is 19. If this poetry seems unsophisticated for a worldly 19-year-old, you should read some of her other poems, which are superimposed on the screen in her own handwriting, and (I am afraid) her own spelling. Lucy is a creature without an idea in her head. She has no conversation. No interests. No wit. She exists primarily to stir lust in the loins of the men. After the death of her mother, a poet who visited these Italian hills 20 years ago, Lucy has come back to an artists' home with two things on her mind: She wants to discover the identity of her real father, and she wants to lose her virginity. Experienced moviegoers can assess the risk that she will solve these problems simultaneously. 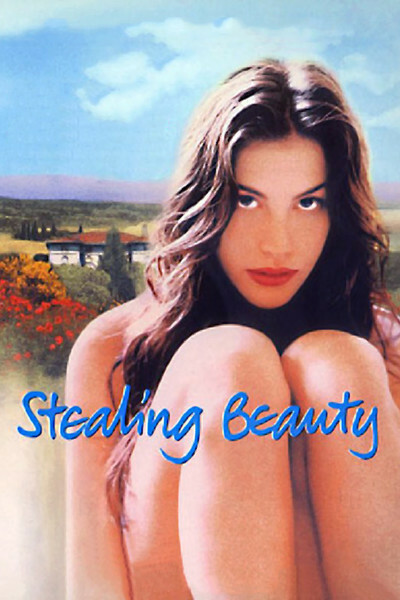 “Stealing Beauty” is the new film by Bernardo Bertolucci (“Last Tango in Paris,” “The Last Emperor”), who like many a middle-aged man before him has been struck dumb by the beauty of a nubile young girl, and has made the mistake of trying to approach her on what he thinks is her level. The movie plays like the kind of line a rich older guy would lay on a teenage model, suppressing his own intelligence and irony in order to spread out before her the wonderful world he would like to give her as a gift. Look at these hills! These sunsets! Smell the herbed air! See how the light catches the old rose-covered villa! The problem here is that many 19-year-old women, especially the beautiful international model types, would rather stain their teeth with cigarettes and go to discos with cretins on motorcycles than have all Tuscany as their sandbox. (For an example of a cannier May-December seduction strategy, consider the recent release, “Nelly and Monsieur Arnaud,” in which an older man fascinates a young woman by emphasizing his age and experience and pretending to be beyond her charms.) Lucy is played by Liv Tyler, a young actress who has been profiled in all the glossies by writers who find it delightful that she thought her father was one rock star when in fact he was another. Thus there is an “autobiographical” component to her search among the artistic lay abouts at the Tuscan villa for the man who seduced her mother 20 years ago. Tyler is indeed attractive, and looks enough like Lili Taylor to be her sister. But Lili Taylor usually plays smart women, and if she were in this movie her B.S. Alarm would be ringing constantly. The villa is occupied by a sculptor (Donal McCann), who starts on a tree trunk with a chain saw and is soon sandpapering the curve of Lucy's chin. His earth-mother wife (Sinead Cusack) is tired after 20 years of cooking and keeping house for a continual house party, and no wonder. The most interesting guest is a gay playwright (Jeremy Irons) who is dying of AIDS and attracts Lucy because he is not after her. Other guests include an art dealer (Jean Marais), an advice to the lovelorn expert (Stefania Sandrelli), a designer (Miranda Fox) and an entertainment lawyer (D.W. Moffett), who sighs, “I think it would be great, you know, to just sit around all day and express yourself.” Neighbors drop in, including assorted young men, one of whom may have sent Lucy a letter which she thinks was romantic and poetic--as indeed anyone who writes like Lucy would. The movie is great to look at. Like all those other Brits-in-Italy movies (“A Month by the Lake,” “Enchanted April,” “A Room With a View”), it makes you want to find this place and go there. In this case, however, you hope the movie characters have moved out before you get there. There is a simmer of discontent beneath the surface of everyday life in the villa, a sort of sullen, selfish unhappiness that everyone has about his or her lot in life. The purpose of the Lucy character, I guess, is to act like a catalyst or a muse, shaking up old patterns and forcing these exiles to decide where their homes really are. She is fresh and they are decadent narcissists. Only the Jeremy Irons character, absorbed in his dying, and the Donal McCann character, absorbed in his art, have lives of any meaning. The young men who buzz about Lucy are of no substance whatever. The older men are of similar substance, but can make better conversation, which would be useful if there were any evidence that Lucy was a conversationalist. Actually she serves for Bertolucci more as a plot device than as a person. She represents some kind of ideal of perfect virgin beauty, and the film's opening shots, in which a photographer on a plane sees her sleeping and takes closeups of her lips and crotch, set the tone. The sad thing is that, sleeping, she embodies what she represents to this movie just as well as when she's awake.